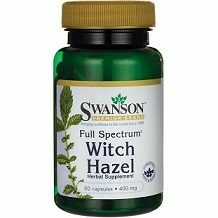 The goal of our Swanson Premium Full Spectrum Witch Hazel review is to provide you with all the necessary facts you need to know about this product. Full Spectrum Witch Hazel is a natural daily supplement designed to promote your overall health and well being. Witch hazel is also commonly used in the health supplement industry for the treatment of varicose veins. As the name suggests, the only active ingredient in this product is 400 mg of witch hazel leaf. Witch hazel has been used as a traditional medicine for centuries because of its healing properties. It is a natural astringent which means that it helps to contract and strengthen blood vessels which could reduce varicose veins.It also helps to reduce swelling and pain. It is unfortunate to see that this product also contains additional fillers such as rice flour. Swanson Premium is presented in gelatin capsules and recommends taking one capsule a day with water. Since this product is natural, it is fairly safe to use and only has minor side effects such as Gastrointestinal discomfort and nausea. This product is not suitable for women who are pregnant or nursing and you should consult your doctor first if you are taking any prescription medication. One bottle of Full Spectrum Witch Hazel contains 60 capsules and retails for $4.19. There is an auto-ship option available if you purchase this product online directly from the manufacturer. Consumers should be advised that auto-ship subscriptions often come with hidden costs and are usually difficult to cancel. While Swanson Premium has mentioned a guarantee, they have not provided any details about the time frame consumers have in which to return this product if you are not satisfied. 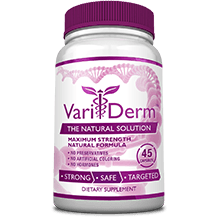 There are a few positive things to be said about this product such as the price and that this product only contains natural ingredients, however, we are disappointed that the formula contains additional fillers which offer no nutritional value. Rice flour is usually synthesized and may compromise the effectiveness of the active ingredients. The information presented on the website was very limited and did not provide enough factual based evidence that this formulation does in fact work. We were also disappointed to find that there were hardly any responses from consumers online about this product. Based on the lack of evidence and social proof, we cannot confirm that Full Spectrum Witch Hazel is effective enough to reduce varicose veins.